Synopsis: The final instalment begins as Harry (Daniel Radcliffe), Ron (Rupert Grint) and Hermoine (Emma Watson) continue their pursuit to find and destroy Voldemort’s three remaining Horcruxes, the enchanted components responsible for his perpetuity. 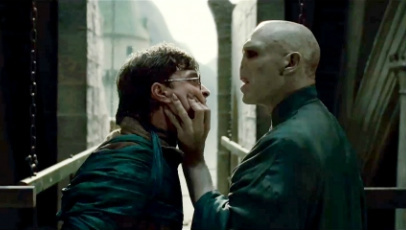 But as the mystical Deathly Hallows are unearthed, and Voldemort learns of their plan, the ultimate battle begins. Life as life as they know it will never be the same again. Fast-paced, cleverly edited and diligently directed by David Yates, Harry Potter And The Deathly Hallows: Part 2 takes a route unexplored by the previous seven films. There is no spoon-feeding here. Steve Kloves, who returns as regular screenwriter, delves straight into the action. He abandons any expected “catch up” in exchange for an intense, all-out finale. While the action is non-stop, to the point where several set pieces are taking place at once, what’s really astonishing is the film’s unfaltering focus on both the narrative and the characters at hand. This puts Deathly Hallows: Part 2 in a class of its own. Yates and Kloves have left no room for filler, and have delivered the conclusion that everyone hoped for. With such a focus on the characters, performances are pushed to centre stage. Thankfully, they are uniformly excellent. The central trio of Radcliffe, Grint and Watson shine, as do a host of supporting characters who have previously taken a back seat. The most notable of these are Matthew Lewis as Neville, Alan Rickman as Professor Snape, and an indomitable, playful and incredibly quotable Maggie Smith as Professor McGonagall. It’s a testament to the material that so many established British actors were keen to return, even if that meant making the most brief of appearances. Emma Thompson and Jim Broadbent may only have one or two lines, along with Gary Oldman, Miriam Margoyles, David Thewlis, Jason Isaacs and David Bradley, but their mere presence ties together ten years of cinema, reinforcing the emotional punch Deathly Hallows: Part 2 so effectively delivers. Even a non-fan is unlikely to leave Deathly Hallows: Part 2 without feeling thoroughly entertained. This film proves that a phenomenally successful franchise can be concluded without an inevitable anti-climax and shows just how a summer blockbuster should be constructed. It contains everything a fantastic piece of cinema needs: it’s exhilarating, emotional, humorous and fantastically well executed. The final touch is a spectacular soundtrack delivered by a true legend, Alexandre Desplat. On that note, all that’s left to say is that Harry Potter and the Deathly Hallows: Part 2 is skilfully directed, beautifully paced, superbly acted, and chock full of the best kind of tear-inducing sentimentality. In simple terms, it’s an extraordinarily befitting conclusion to a profoundly satisfying franchise.